And just like that, the first two weeks of 2018 are over. Have you stuck to your New Year’s resolution? Have you even made a New Year’s resolution? One of our resolutions in the Draper James HQ is to eat a little better. While we’ll never say no to fried chicken and biscuits, we try to have a bit of balance in our lives. 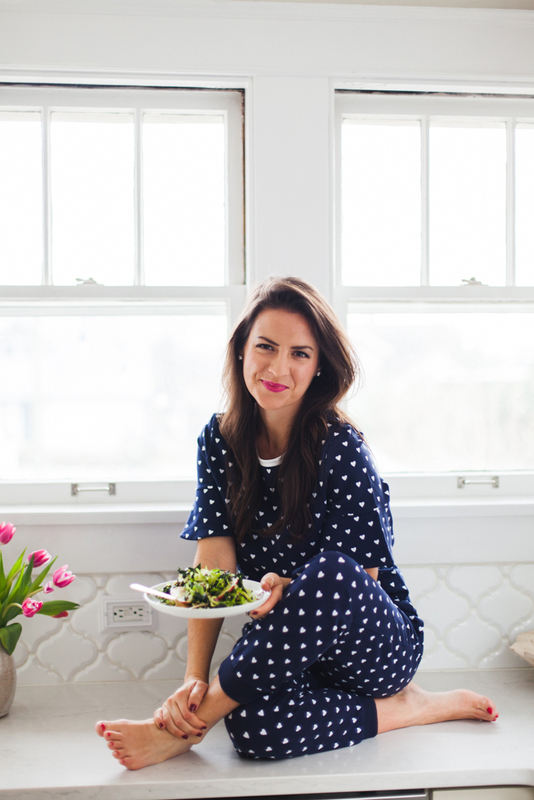 Melissa Haithcock of A Happy Healthy Heart, one of our Nashville ladies, makes achieving that balance perfectly painless, especially when she shares delicious recipes like this Shaved Brussel Sprout and Kale Salad. I love this salad because it’s crisp, crunchy, and really fresh. This time of year I’m always on the hunt for something that gives me energy. 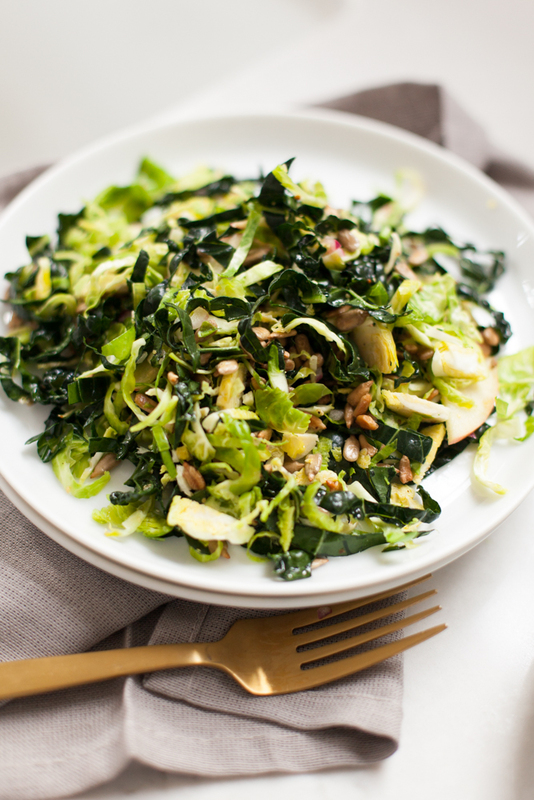 Loaded with nutrient-dense greens, it is a great dish that can help keep the winter blues away. 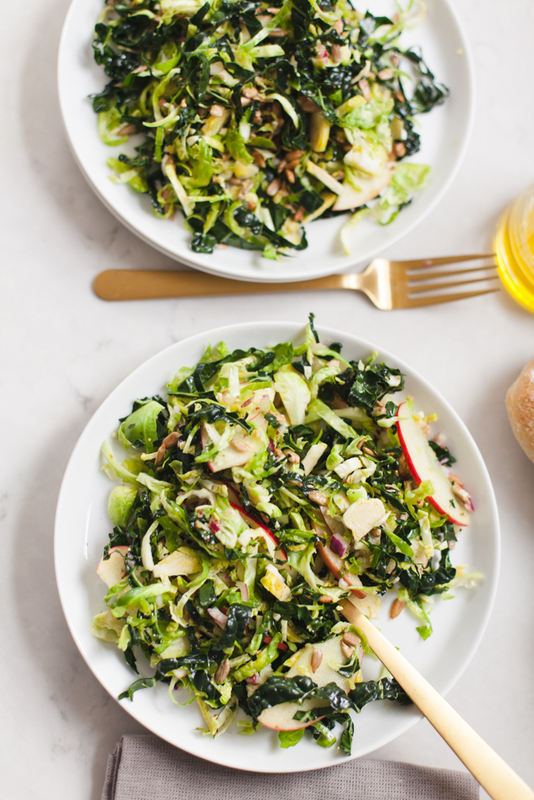 Being that it only takes about 10 minutes of prep time, this salad is perfect for throwing together when hosting friends or for an easy weeknight meal. What drew you to the Draper James Love Row Ruffle Knit Tee and Jogger Pants? I’ve said it before and I’ll say it again: I LOVE navy and white. It’s such a classic color combination. During the first few months of the year, when it’s too cold to go outside, I like to stay in the kitchen and get creative. This is the perfect outfit for that. 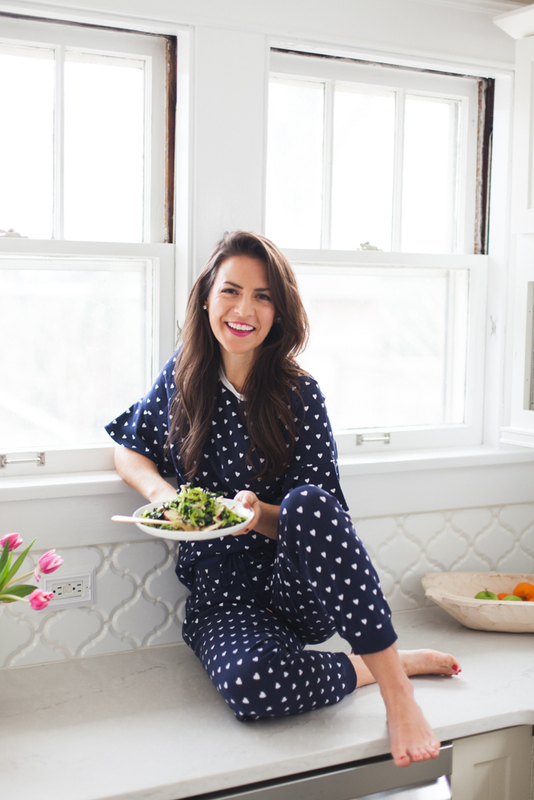 It’s comfortable and breathable, which is a win-win for me when I’m in the kitchen! I don’t typically set one New Year’s resolution, but instead make concrete goals that I hope to achieve that year. Each year, my husband and I find a word for one another that will represent that specific year. This year my word is “hopeful,” I have a lot to be hopeful for in 2018 and can’t wait to see how it unfolds. Once heated, put sunflower seeds on a sheet pan and toss with 1 tbsp olive oil. Roast for 6-7 minutes or until golden brown. Meanwhile, prepare salad. 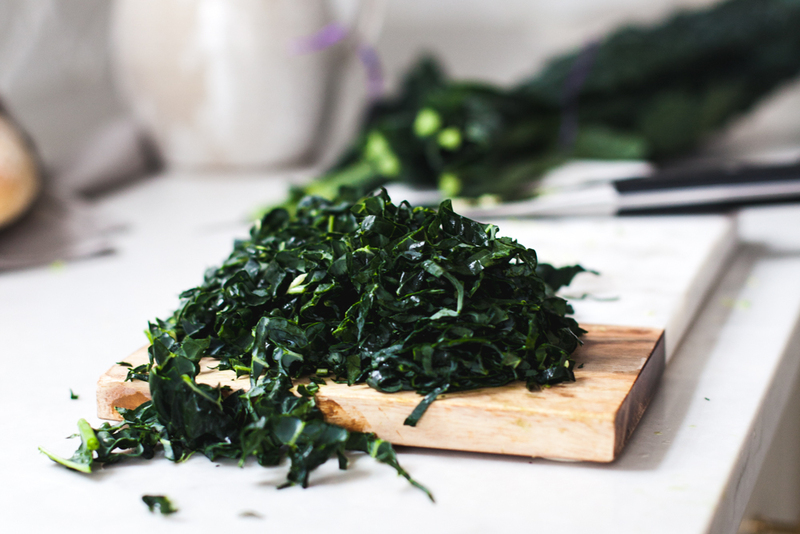 De-rib the kale, place each leaf of top of one another, roll tightly and slice so that the kale forms thin strips. Put kale into a bowl. 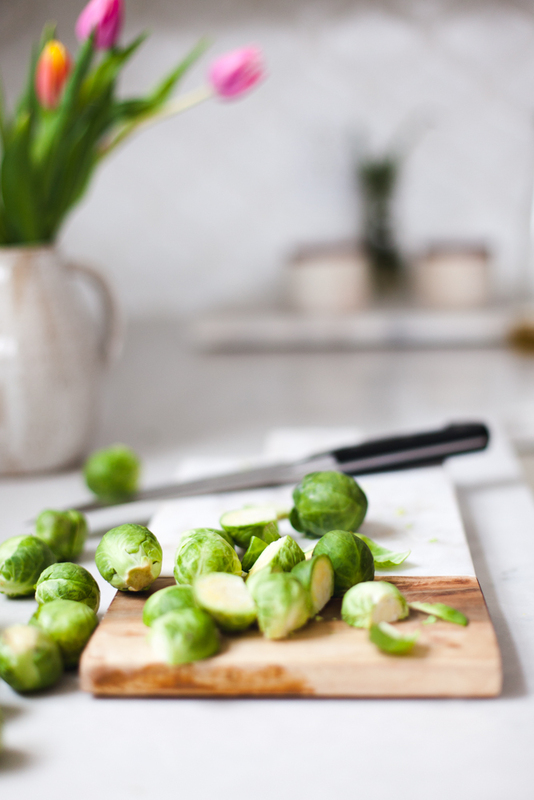 To slice brussel sprouts, cut the end off of each, slice in half (the long way), put both halves face down, and thinly slice. Once all the brussel sprouts are chopped, put into the bowl with kale. Toss in apple slices. To prepare the dressing, combine the lemon juice, mustard, onion, salt, and pepper. Stir and add in olive oil. 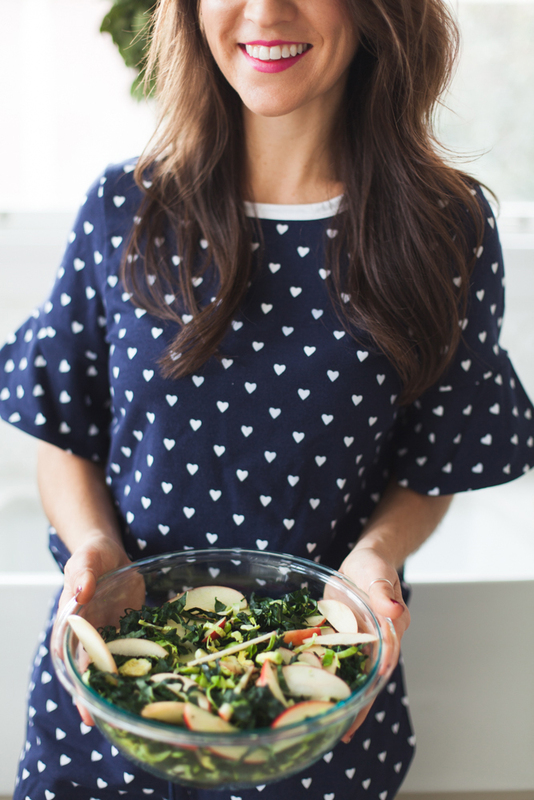 Pour dressing over salad and massage with your hands for a few minutes. This will help the bitterness of the kale and sprouts to break down. Top with roasted sunflower seeds and serve. If you have time, allow the salad to sit in the refrigerator for a few hours so the dressing soaks into the salad well.